Book by Winnie Holzman. Based on the novel, Wicked: the Life and Times of the Wicked Witch of the West by Gregory Maguire. Music and lyrics by Stephen Schwatrz. The original Broadway production opened on 30 October 2003 and was directed by Joe Mantello, with musical staging by Wayne Cilento. The show begins with the end of the story, as Glinda coming down in a bubble giving the citizens of Oz the news of Elphaba’s death (NO ONE MOURNS THE WICKED). We learn that Elphaba’s was born the illegitimate daughter of a traveling salesman. Her skin was green because of a drink her mother purchased from her lover, who rejected the child because of her unusual complexion. Glinda then takes us back in time, to her days at DEAR OLD SHIZ – where she first she met Elphaba. Galinda – as she was then known – is completely carefree, while Elphaba takes care of her crippled sister, Nessarose. Elphaba is a particularly unpopular student, mainly because of her green skin. However, one of the teachers, Madame Morrible, discovers that Elphaba has an amazing natural talent for magic and tells her that she has the potential to work alongside the wonderful Wizard of Oz if she buckles down and makes something of herself (THE WIZARD AND I). Galinda – whose only reason for attending Shiz was to attend Morrible’s renowned sorcery program – is not accepted into the course, and she’s shattered. Furthermore, a funny mixup sees Galinda and Elphaba – who by this time truly loathe each other – end up as roommates (WHAT IS THIS FEELING?). The fact that Elphaba becomes the the teacher’s pet because of her brains and talent does little for her popularity. She befriends Dr. Dillamond, a Goat, who is afraid that he will be taken away to some sinister fate. During one of their conversations, Elphaba learns that things in Oz aren’t always as they seem (SOMETHING BAD). Meanwhile, the more popular Galinda has managed to find herself a boyfriend – the prince, Fiyero (DANCING THROUGH LIFE). When the time comes for the dance at the Ozdust ballroom, Galinda manipulates Boq, a munchkin with a huge crush on her, to invite Nessarose to the ball, even though he doesn’t love her and just feels sorry for her. Galinda also gives Elphaba a really unfashionable hat as a cruel joke. Elphaba accepts the hat, thinking it’s a gift and, in return, secures Galinda a place in Morrible’s program. Galinda feels awful for what she has done, but it’s too late. Elphaba is already on the dance floor, and everyone is making fun of her. Galinda goes and dances with Elphaba, and the students follow suit. After the dance, Galinda has a new affection for Elphaba, and begs that they exchange secrets. Galinda says that she is going to marry Fiyero, even though he doesn’t know it yet. Elphaba sadly admits that her father hates her and that she was blamed for her mother’s death. She carries around a bottle of green elixir, which was all she had as a memento of her mother. Galinda, touched, decides to make Elphaba her new “project” (POPULAR). The next day, Fiyero starts falling for “Elfie”, as Galinda has dubbed her. Things take a turn for the worse, however, when Dr. Dillamond is taken away. At the same time, a live lion cub is being used as a classroom experiment. Outraged, Elphaba stops the lesson using magic. With Fiyero – who was not affected by her spell – she runs into the woods to let the cub free. Fiyero, thrilled and enchanted, yet also a bit embarrassed, awkwardly leaves, while Elphaba wistfully ponders her own feelings for him (I’M NOT THAT GIRL). Madame Morrible finds Elphaba to give her some news: she has been officially invited to the Emerald City. Later at the train station, Nessarose notices that Boq’s attention doesn’t seem to be exclusively focused on her. Fiyero shows up and is very courteous and attentive to Elphaba, mentioning how horrible Dr. Dillamond’s arrest was and how they rescued the lion cub. Feeling ignored, Galinda first puts on a brave face and then, trying to join in, announces that she will change her name to Glinda in honour of Dr. Dillamond, who could never pronounce her name properly. Elphaba then invites Glinda along to the Emerald City (ONE SHORT DAY). There, they meet the Wizard of Oz, who says he wants to make Elphaba his assisstant. To prove herself, she needs to give a monkey named Chistery the ability to fly (SENTIMENTAL MAN). She opens up an ancient and immensely powerful sorcery book called the Grimmery and proceeds to chant out a spell. To their amazement, Chistery grows wings. The wizard then shows Elphaba her power by opening a curtain and showing her a cage full of monkeys with wings. She has created a perfect set of spies for him. Elphaba now realizes that she’s been duped into helping the Wizard exploit and harm animals, including Dr. Dillamond. She also understands that he has no power at all and needs someone with power, like her, to do things for him, using the Grimmery. She steals the Grimmery and escapes. Elphaba says goodbye to Glinda, vowing that she she will fulfill her destiny – to fight the wizard with every last ounce of strength (DEFYING GRAVITY). Some time passes and the second act opend at a celebration – Glinda – unbeknownst to Fiyero – has decided to get married. Glinda, Fiyero and Madame Morrible, are all government officials now and, despite his success, Fiyero is not enthusiastic about life at the moment. He hates what is happening to Elphaba and, ironically, he is in charge of the hunt to find her. He leaves halfway through the ceremony because he can’t take the lies, propaganda and superficiality of it all any longer, making Glinda’s happiness and glee abruptly succumb to feelings of sadness and discontent. She contemplates at what cost she has achieved her dreams (THANK GOODNESS). Elsewhere, Nessarose is now governor of Munchkinland and has stripped the Munchkins of their rights in order to keep Boq – now Nessa’s official servant – with her (THE WICKED WITCH OF THE EAST). Elphaba arrives, hoping to find a hiding spot and to get get some help from her father. Nessa, who has become mean and bitter is angry with Elphaba for abandoning her and demands to know why Elphaba hasn’t given her the ability to walk. Elphaba casts a spell on Nessa’s slippers, which become ruby coloured, so that she can walk. Nessa is overjoyed and Elphaba is happy that she has finally done something good with her powers. Boq thinks that this turn of events frees him of his obligations to Nessa, but she has other plans. In a rage she casts a spell on him from the Grimmery despite Elphaba’s efforts to stop her. Boq’s heart starts to shrink and Elphaba, desperate to save his life, turns him into tin. He’s lost his heart though, and Nessa blames Elphaba for the disaster. Elphaba decides to return to the Emerald City, so she can free the flying monkeys. The Wizard stops her and tempts her into giving up her cause and staying to become a celebrity (WONDERFUL). She almost gives in, but notices a shrouded figure in the background. It is Dr. Dillamond, who has been completely reverted into a dumb animal. He does not even remember her. Elphaba rejects the Wizards offer and tries to leave. The Wizard wants to imprison her, but Fiyero bursts to her rescue. Glinda also arrives, and is overjoyed to see her friend again. However, her joy turns to heartbreak and hatred when Fiyero runs off with Elphaba (I’m NOT THAT GIRL – REPRISE). Glinda maliciously suggests to Madame Morrible and the Wizard that they use Nessarose as bait to capture Elphaba. They think it is a good idea but decide to take the plan one step further. Hidden away in Fiyero’s castle, Elphaba and Fiyero confirm their newfound love (AS LONG AS YOU’RE MINE). But Elphaba sees a strange vision of a flying house in the sky, and flies off to Munchkinland to discover the death of her sister and the arrival of Dorothy, a young girl from Kansas. Elphaba and Glinda fight, verbally and physically, and Fiyero once again arrives to save Elphaba. This time, he is sentenced to death unless he will reveal where Elphaba is hidden. He refuses to betray her and taken to a field, where he is placed on a stick and left to die. Back at the castle, Elphaba, desperately tries to cast a spell to save Fiyero’s life. Thinking that she has failed once more, she realises it is time to embrace the full implications of her powers (NO GOOD DEED). Elsewhere in Oz we see the mobs preparing to have a witchhunt (MARCH OF THE WITCH HUNTERS). Glinda starts to understand the larger scheme of things and confronts Madame Morrible about it, asking how Nessa died. Madame Morrible merely snaps back angrily and warns Glinda to do her job without asking questions. Meanwhile, Elphaba has captured Dorothy. Glinda arrives at the castle to try to persuade her to let Dorothy go. Glinda’s appearance, combined with a note about Fiyero, lead Elphaba to an emotional breakdown, where she admits her failures in spite of all her good intentions, which were no match for the corrution in Oz. She begs Glinda to take over – to try and achieve all the good things that Elphaba feels in her heart – and to let her die in peace. She also makes Glinda promise never to exonerate her. This will give her protection against the evil corruption of the Wizard, Madame Morrible and the citizens of Oz. Finally, Elphaba gives Glinda the Grimmery, telling her that is she learns how to use the book, it will give her all the power she needs. The two friends say their final goodbyes, affirming their friendship for the last time (FOR GOOD). After Elphaba has melted, Glinda leaves to resolve old problems. Glinda first puts two and two together. Elphaba carried her mother’s bottle of green elixir all her life and Glinda had only seen this elixer in one other place – with the Wizard. The Wizard was Elphaba’s father and as a child of both Earth and Oz, she had great powers. The Wizard is sent away from Oz in his hot air balloon and Glinda takes over. At the Witch’s castle, a scarecrow arrives to examine Elphaba’s hat – the only apparent remainder of her legacy. He kicks it aside and taps on the floor. A secret trapdoor in the ground opens to reveal Elphaba – safe and sound. The scarecrow turns out to be Fiyero, who was indeed saved by Elphaba’s spell by being turned to straw. Elphaba realises that, for her safety, they must leave Oz forever. As she makes her departure, we return to the opening moments of the play. Glinda – with a happy face and a heavy heart – prepares to relate the news of Elphaba’s death to the citizens of Oz (FINALE). FROM LEFT TO RIGHT: 1. Wicked Original Broadway Cast CD. 2. Wicked Original Broadway Cast MP3 Album. 3. 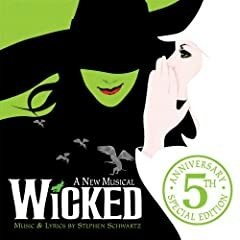 Wicked Original Broadway Cast Recording CD: 5th Anniversary Edition, with extra tracks. 4. Sing the Songs of Wicked Backing Track CD. 5. Wicked Karaoke CD. FROM LEFT TO RIGHT: 1. Wicked, the novel by Gregory Macguire. 2. Son of a Witch, the second novel “in the Wicked years” by Gregory Macguire. 3. A Lion Among Men, the third novel “in the Wicked years” by Gregory Macguire. 4. Wicked: the Grimmerie, a Behind-the-Scenes Look at the Hit Broadway Musical, including the complete libretto of the musical. 5. Wicked Piano Vocal Selections. FROM LEFT TO RIGHT: 1. Defying Gravity: The Creative Career of Stephen Schwartz, from Godspell to Wicked by Carol de Giere. 2. The Wicked Truth by Suzanne Ross. 3. A Little Bit Wicked: Life, Love, and Faith in Stages by Kristen Chenowith. 4. 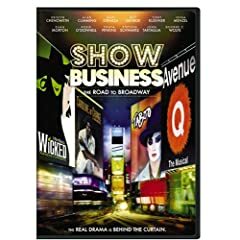 Show Business: the Road to Broadway DVD documentary with information on Wicked. 5. 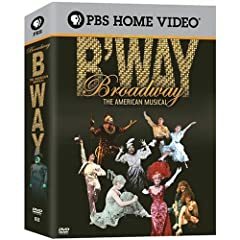 Broadway: the American Musical DVD with clips from Wicked. Greetings! My name is James C. Wallace II and I have just returned from the land of OZ where I met some of the most unusual and interesting characters ever imagined. During my stay in that magical land, I learned of a young boy.